Sharing easy, healthy and delicious vegetarian recipes. 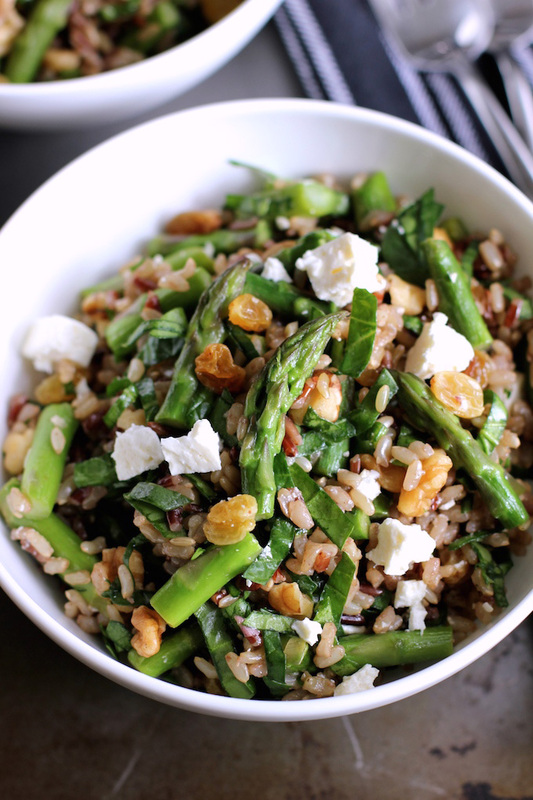 Brown rice salad with asparagus and spinach – an earthy, filling salad with a touch of sweetness. 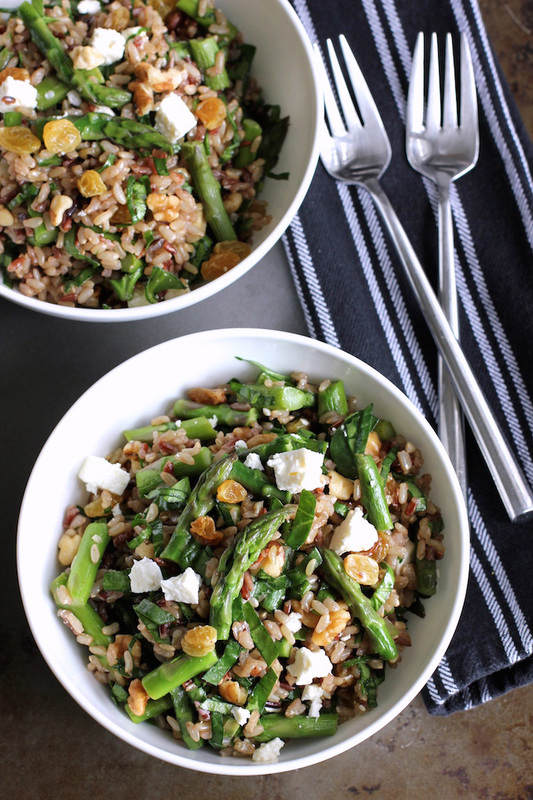 A combination of chewy, nutty brown rice, flavorful asparagus, fresh spinach, golden raisins, walnuts and feta cheese. All tossed with a bright lemony dressing. This brown rice salad with asparagus and spinach is a hearty, flavorful combination of chewy, nutty brown rice with sautéed asparagus and fresh, chopped, baby spinach. Sweet golden raisins, crunchy walnuts and salty feta are also added and then the whole salad is tossed with a vibrant lemon dressing. This salad has a combination of nutty, earthy flavors with a touch of sweetness from the golden raisins and a lemony kick from the dressing. Asparagus has all of a sudden shown up at the supermarket at a really low price. A sure sign of spring. 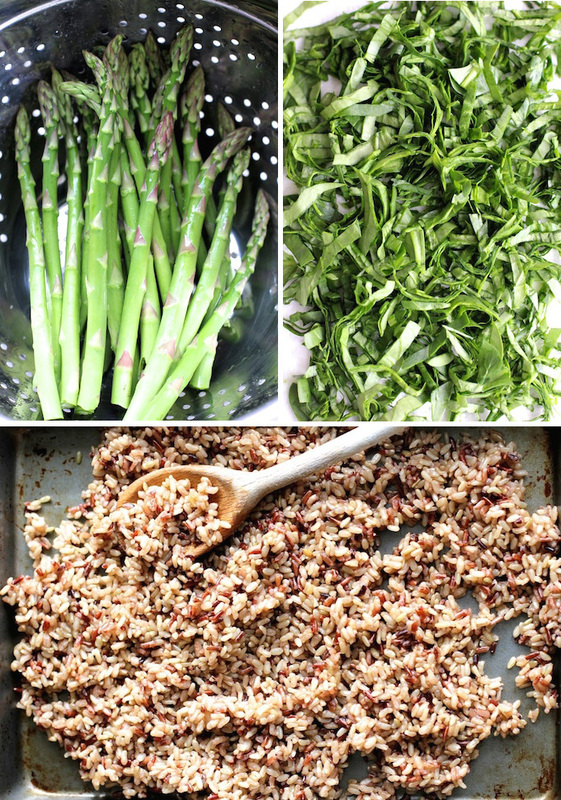 The asparagus, in this salad, is sautéed lightly with garlic while the brown rice cooks. The baby spinach is cut into thin strips using a chiffonade technique. You stack the spinach leaves on top of each other, then roll it up tightly – sort of like how a cigar is rolled up. Next the rolled up spinach is cut/sliced perpendicular to the roll – producing ribbons of spinach. If that’s too fussy for you, then just give the spinach a rough chop with a knife instead. I’ve been experimenting with brown rice salads lately. Brown rice is a great filling to add to salads. It’s got a nutty, chewy texture. It holds its shape well. And it doesn’t dry out (like white rice would) if you planning on eating the leftovers the next day. I used a brown, red, black rice combination from Trader Joe’s. Plain brown rice or a brown and wild rice combination would work just as well. When the rice has done cooking, let it rest in the pan with the lid on for 10 minutes, then turn it out onto a baking sheet to cool slightly. If it’s too warm it will melt the feta cheese. Snap off the tough ends of the asparagus and rinse the spears of asparagus. You want the asparagus to be damp when you add it to the pan – so don’t dry it off completely. When you chop up the asparagus, chop it into bite sized pieces. I plump up my raisins by adding them to a small bowl and covering them with hot water. This soften the raisins. This salad works well cold. So make a big batch and use the leftovers as an easy, packable lunch to bring to work the next day. An earthy, filling salad with a touch of sweetness. A combination of chewy, nutty brown rice, flavorful asparagus, fresh spinach, golden raisins, walnuts and feta cheese. All tossed with a bright lemony dressing. 1 1/4 cup of brown rice – cooked according to package instructions. 1 bunch of asparagus – about 1 pound – snap off the tough ends of the asparagus and discard. Chop the asparagus into bite size pieces. Cook brown rice according to package instructions. When done, remove from heat and let brown rice sit with lid on for 10 minutes. After rice has rested for 10 minutes, turn it out onto a baking sheet so that it cools slightly before adding to salad. While rice is cooking, chop asparagus and mince garlic. In a frying pan over medium heat, add 1 tbs olive oil and minced garlic. Cook for 30 seconds, stirring so garlic doesn’t burn. Add chopped asparagus, tossing to coat with oil. Cover frying pan with lid, turn down heat to low and let asparagus cook for 5 minutes. Shake the pan occasionally as it cooks so the asparagus doesn’t just cook on one side. Test for doneness – asparagus may take longer to cook if it’s really thick asparagus. When done, add to a large bowl. Chiffonade spinach (or give it a rough chop) and add it to the bowl. Plump up raisins by putting them in a small bowl and adding a little hot water. Let sit for a couple of minutes and then strain. Add raisins to the bowl with the asparagus and spinach. Add slightly cooled rice to salad. Add diced feta to salad. Make dressing by whisking together olive oil, lemon juice, honey and pepper. Toss over salad to combine. Lots of tips in the notes, really appreciated them,made a big difference to this recipe.Loved spinach chiffonade! I’m glad the tips were helpful. Thanks for leaving a comment and a rating – much appreciated! Thanks so much, Kate. I’m with you on asparagus – sooo good! Wow is this salad ever calling my name? I love how you cut up the spinach, I’ve never done that before, but I bet the ribbons have a wonderful texture with the rice and the feta! Thanks, Denise. The spinach comes out really nice like this – all very even in size which I like in a salad – so you don’t get a big old mouthful of greens. Hope you try it! I love the combination of flavors in this salad, Geraldine. The sweetness from the raisins, saltiness from the feta, and the earthy crunch of the nuts sounds perfect. I’ve been really excited about asparagus lately too, and like your idea of sauteing it with some garlic. And great idea to add some heartiness with the rice. I’m going to have to look out for that rice combo you mentioned from Trader Joe’s! Thanks for the inspiration, Geraldine! Thanks so much, Julia. Definitely keep an eye out for the TJ rice combo – it’s great. And I’m all for as much asparagus as possible when it’s in season – and even when it’s not :). I really like the idea of using brown rice as the base for this salad. Sounds like a great combination of everything! Thanks so much, Kathy. The brown rice worked really well as a base for the salad. I’m planning on try a bunch of new combinations – using whatever is in season. I must try this! This recipe makes me very anxious for spring. It looks perfect for the patio with a glass of wine! Hi Brittaney – I think a glass of wine makes everything better 🙂 – hope spring gets to you real soon! Thanks for stopping by. Isn’t that the best, Izzy – just love it when asparagus is in season! You make the best salads, Geraldine! Always so creative and full of texture and variety. This one is no different; you got the creamy, the crunch, the chewy with a wide array of flavors. I love brown rice, too, as a base for salads. I’ll have to see if I can find the rice you’ve used here, it sounds delicious! I’m lovin’ those overhead shots and the lighting is so soft. Although I love this salad and the shots of it, I can take my eyes off the overhead of the individual components! So, so pretty! Way to go girl! Thanks so much, Traci! Compliments from you mean a lot since your photos are always so inspiring. And definitely yes to brown rice salads. I’m planning on cooking up a big batch of brown rice each Sunday to have on hand each week to throw into salads. Goodness this looks good! I love that you cut the spinach chiffonade and used brown rice. Such a delicious hearty salad. The addition of walnuts and feta are perfection! Thanks so much, Annie. Hearty salads are my favorites – love being able to take the leftovers to work the next day! 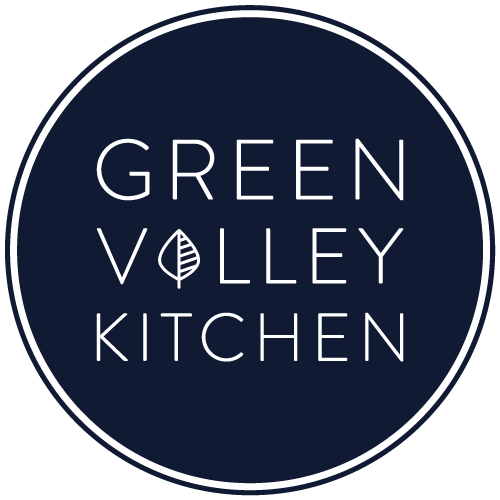 Never Miss A Recipe from Green Valley Kitchen! Green Valley Kitchen © 2019. All Rights Reserved.